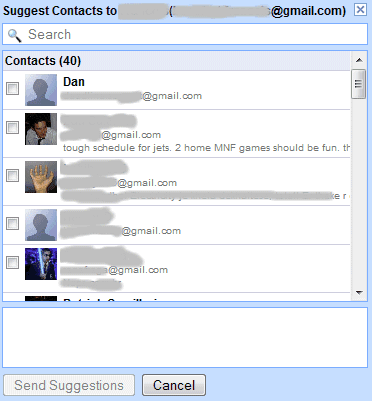 The Google Chat gadget from iGoogle's sidebar started to show friend suggestions and they're usually people you've emailed frequently. 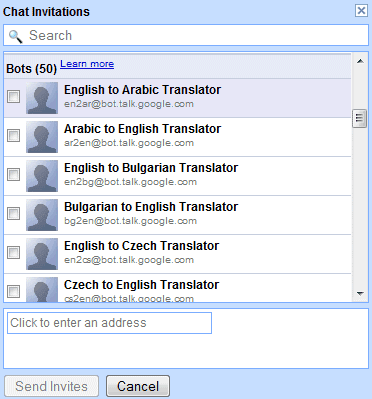 Google also shows a list of Google Translate bots that help you translate the messages from a conversation. Another new feature lets you send some of your contacts to someone you've emailed frequently. It seems that the suggestions are displayed even if you've enabled this option in Gmail: "Only allow people that I've explicitly approved to chat with me and see when I'm online". By default, Gmail automatically invites to Google Chat the users whom you frequently email. "Gmail determines which contacts you'll be able to talk to without having to invite each other." what happens if you often email people (friends) who don't use gmail? Google Chat and Google Talk don't require Gmail accounts. You only need a Google account to use them. I'm getting popups suggesting people that are frequently CC'ed in e-mails to me. These are fringe relationships on a profesional level, I don't want to 'chat' with them and break professional courtesy. I'm afraid I'll accidently invite one such relationship if I keep getting the popup. Click on "Options", select "Chat settings" and uncheck "Display contact suggestion banners".